Berthe Morisot was closely associated with French Impressionism and actively participated in all the group’s exhibitions. She maintained close and creative links with Manet, Renoir and Degas, sharing their interest in subjects derived from everyday life and in capturing the effects of light. The Cheval-Glass, which was included in the Impressionist exhibition of 1877, is an excellent example of these interests. A woman gathers up the waist of her loose blouse at the back, possibly imagining the effect of wearing a corset. The light, entering from the two windows that flank the mirror in which she looks at herself, and the reflections on the mirror create a rich tonal range of whites. The full-length figure of the woman is depicted in a flirtatious pose, her left shoulder bare and turned towards the viewer. A tilting dressing mirror of this type was known as a Psyche, a title that was given to this painting on various occasions. The painting, exquisitely executed with gentle touches and intense light, shows a young woman slowly donning her clothes in the solitude of her bedroom before the Empire-style dressing mirror or psyche that belonged to the painter. 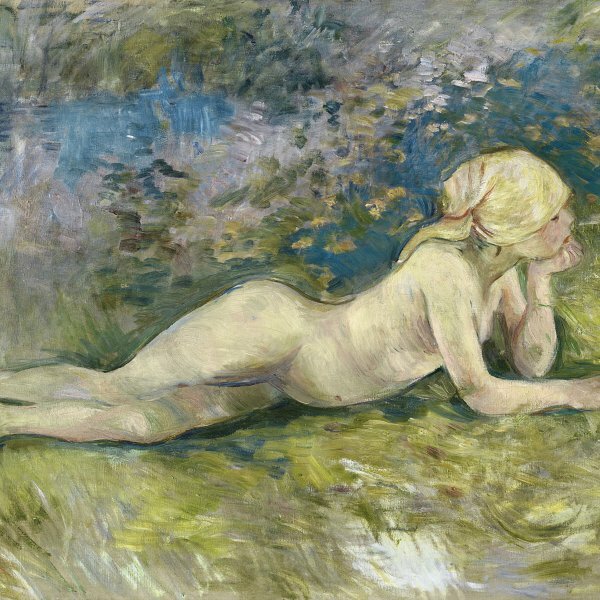 Representation of the world of women’s feelings was such a permanent feature of Morisot’s oeuvre that her friend Paul Valéry used to say that the artist “experienced her painting” and “painted her life.”Other contemporary artists had shown an interest in this field, such as Manet, whose Nana, the major scandal of the Salon of 1876, depicts a courtesan powdering her face, and Degas, who painted a few female figures trying on dresses before a mirror. 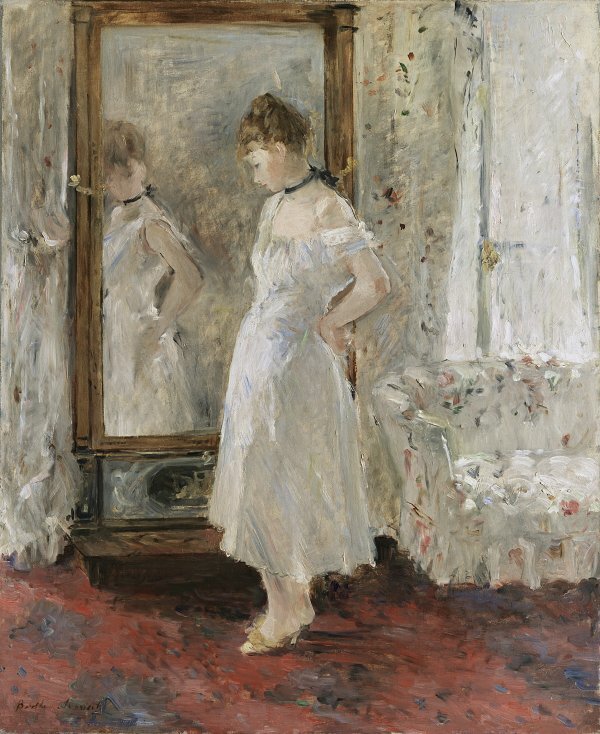 Married to Eugène Manet, the brother of the painter, with whom she enjoyed a close relationship, and one of the founders of the Impressionist group, Berthe Morisot was particularly concerned with studying luminosity and colour and shared the other Impressionists’ interest in light reflections, which explains why mirrors often feature in her works. However, as Tamar Garb has pointed out, the subject of the toilette was also a pretext for exploring a traditional subject in painting, as it “relates to the old theme of Vanity, where Venus or another symbolic female figure is shown studying her own reflection.” Indeed, the title in French — La Psyché — holds a double meaning, as it may refer both to the name of the young woman loved by Eros and to a type of full-length mirror like the one in this painting.